A perfect length train for this particular vantage point! 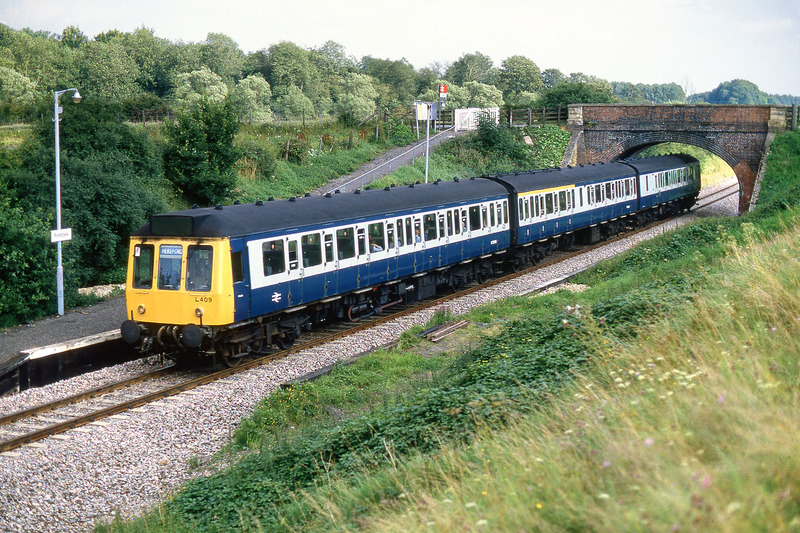 L409 (51386, 59496 & 51344) passes Finstock station on 22 August 1985 with the 2B68 16:10 Oxford to Hereford service. This view shows the diminutive station as it existed from 1971 until 1986, with the former up platform serving the single track. The remains of the down platform can clearly be seen in the foreground, with the overgrown ash covered surface, and sleeper built edging. A year after this picture was taken, the track was slewed into the centre of the formation, and a new platform built on the west side of the line. There was no thought in the 1980s that the line would ever be redoubled, so all this work would have to be done again if the this section of the line was ever to redoubled.